Lauren A. Toomer was born in San Francisco, California. She graduated with with highest honors from the University of California Berkeley, receiving a BA in the Practice of Art, and is currently pursuing her MFA in Art Practice at Stanford University. Toomer has produced a complex body of drawings and sculptural work, offering an all-inclusive take on the genre of portraiture as she explores the degrees of separation that exist between self and other. Her major series address postmortem John and Jane Doe photos posted on the web and the availability of children’s medical images on publicly accessible databases. 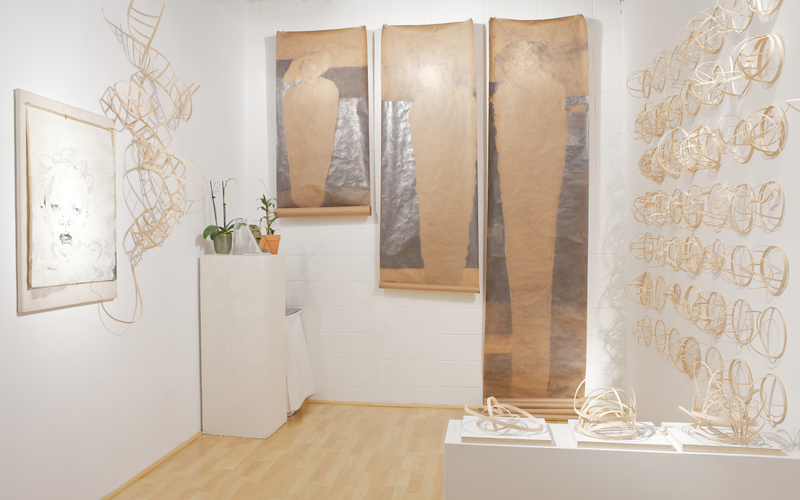 Hand rendered with graphite on paper, found materials, and canvas, her 2D forms often evolve into 3D sculptures like her piece DNA, where the drawing fades into a materialized reed and bamboo object. Informed by medical text, the internet, and her in-person interactions, her research methods are used to create a world with her art that is equally as complex as human consciousness. Toomer’s work continuously unfolds with apparent and hidden figures and mementos, layered and embedded throughout her compositions, and her intricate mark-by-mark constructions of the face and the body encourages the observer to focus on an exchange between the artist and subject and the relationship between the viewer and the viewed.